Solid zebrano upstands are manufactured from the same high-quality timber as our zebrano worktops, and are ideal for giving wooden worktop installations the 'finished' look by providing an elegant and economic alternative to tiling. These worktop upstands help zebrano worktops blend into the overall design of the kitchen whilst hiding the small 5mm expansion gap between the worktop and the wall (a necessary accommodation when installing solid wood worktops). 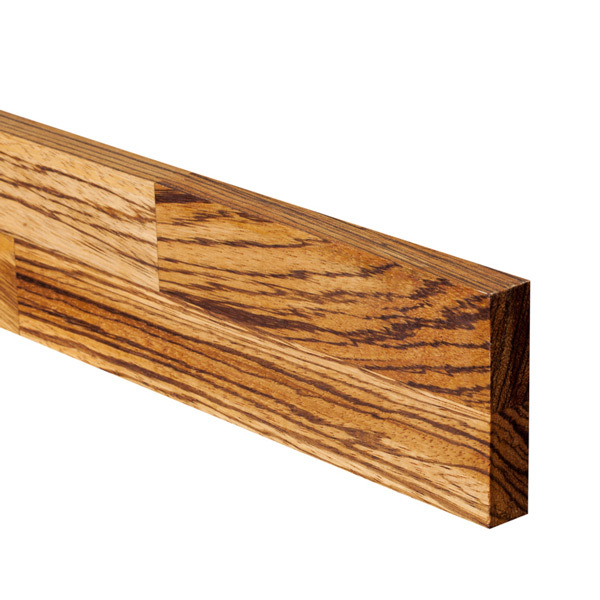 Zebrano kitchen upstands are also recommended when fitting timber worktops against uneven walls, as they will prevent the need for the worktops to be cut-to-size and cover small gaps that would otherwise become obvious. Unlike other kitchen worktop upstands available, our zebrano upstands are supplied with square edges and can therefore be fitted immediately to create an attractive, chunky look; alternatively they can have a different profile applied along the top edge to fit in with your kitchen's design. Made from sections of only the finest solid zebrano, our chopping boards are substantial and hard-wearing, and look fantastic alongside a matching worktop.